Hi friends! Happy Monday! Teehee, or rather let's hope it's a happy Monday. Currently, my hubby is whipping up breakfast smoothies for the kids. He's a show off. I'm only capable of cereal or frozen waffles on weekday mornings. Here's a card I have to show you. I made it last time I crafted at my friend Gina's house aka the Magic House where all my mojo shows up! The paper is Authentique, the punches are Martha Stewart, and the sentiment is Papertrey Ink. This is darling-- love the punches and butterflies! So pretty! Pretty! I love how the butterflies are almost flying off the paper! 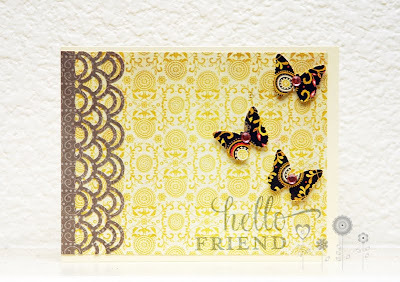 Just came from Jaclyn's blog to check out your card - This is GORGEOUS!! Love the punched edge and the butterflies! !